Amid the ongoing brutal crackdown on demonstrations against President Daniel Ortega’s authoritarian rule in Nicaragua, senior Catholic priests are on the front lines backing the opposition. Some say the government has “declared war on the church,” even as Sen. Marco Rubio warns the country could be on the brink of a civil war. In the Central American country’s capital of Managua, Catholic priests rescued a group of paramedics and Franciscan missionaries who were trapped inside a basilica, where they had sought safety from a pro-government crowd, The New York Times reported. Monsignor Silvio José Báez, auxiliary bishop of Managua, was attacked as he negotiated his way through the crowd to the basilica. Someone slashed him “in the arm and ripped the insignia from his cassock,” according to the NYT. “What the people are going through is much more serious,” he was quoted as saying. The government “has declared war on the church,” Juan Sebastián Chamorro, a member of the opposition alliance, told NYT. Protests across the country have been going on for around three months triggered by planned social security overhauls. Protesters, mostly students, are demanding democratic reforms and that President Ortega and his wife, Vice President Rosario Murillo, step down as they have allegedly established a dictatorship marked by nepotism and brutal repression. Nearly 300 people have died in the ongoing conflict. 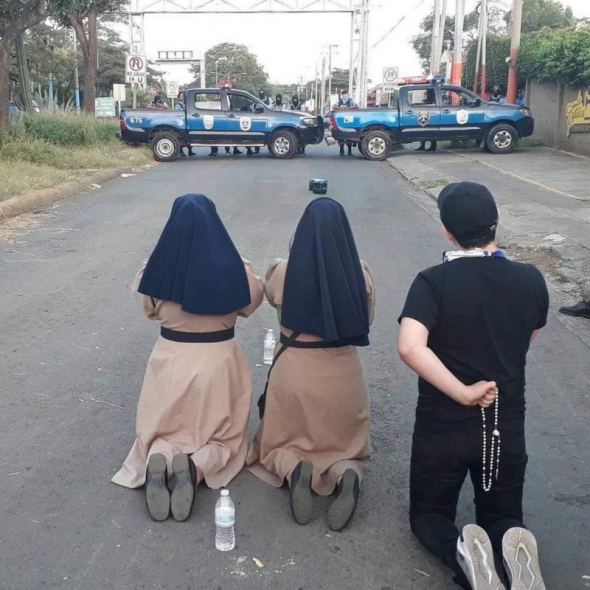 During the initial days of the protests, Ortega requested the Catholic Church to act as a mediator, but his administration also began to use brutal force against the protesters. Now, clergy are being attacked by his supporters.